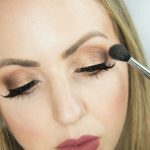 Natural Eye Makeup Tutorial – Minimal and Easy! Are you struggling with your eye makeup? A natural eye makeup look is easy to achieve with minimal products and brushes, even when you’re in a hurry! I hope this natural eye makeup tutorial helps you! One question I get a lot is how I do my eye makeup. I have big, round eyes, and they are so fun for me to play up. I’ve loved experimenting with eyeshadow over the years. I know a lot of us do not have a lot of time day-to-day to glam up, so a natural eye makeup look is our go to. I wanted to show you a few amazing tips that will make you look like you spent more time on your eye makeup than you actually did. I’ve shared this tip a few times on my Instagram stories, but I had to turn this in a blog post because I always get questions about “what eyeshadow” I’m wearing when I do this. I also wrote a more in-depth complete eyeshadow tutorial, if you’re looking for something like that! This is a before and after shot. In the picture on the left, I just have on mascara. Would you believe me if I told you I only used two makeup items and two brushes to achieve this natural eye makeup look? This is one of my favorite makeup tips ever! Anyone can achieve this look and rock it. All you need is a matte bronzer, a fluffy blending brush, and a pencil brush (optional). I’m using the It Cosmetics Bye Bye Pores Bronzer, the Sigma E40 Tapered Blending Brush, and the Sigma E30 Pencil Brush. Swirl your brush into the bronzer and buff it along your crease in windshield wiper motions. To ensure proper placement, you can look down to find your crease, then look up and begin blending. You can also use small circular motions. Keep this bronzer around the crease area. Since I have big eyes, I bring the color onto the crease a little bit (this helps me close in all that lid space), but if you have hooded or small eyes, keep the shadow a little higher. You are not being precise with placement, but the buffing and blending will give you a nice gradient look. You can stop there or take a pencil brush and buff some of the bronzer along the lower lash line. I love that it immediately contours your eyes and makes you look like you’re wearing perfectly blended neutral eyeshadow. I always do this on days when I can’t spend the extra time on eyeshadow but want to look put together. You can apply the bronzer, add mascara, and run out the door. But, you can also take it a step further and create a little more definition to the eyes. Take a creamy eyeliner and apply it along the lash line. I would avoid using a jet black eyeliner – something brown, copper, or even a browny-plum eyeliner like I’m using here will the do the trick. This ensures that the look stays soft and not too smoky. Do not create a thick line here – work in small sections and keep it tight against the lash line. Work one eye at a time at applying the eyeliner on the top lash line, and before it gets a chance to dry down, smudge it with your pencil brush. Repeat this for the lower lash line. I love the soft definition this gives without it feeling too harsh or smoky. It really helps your eyes pop even more! I also like to do this technique when I’m creating a smoky eye. I prefer using creamy eyeliner pencils and smoking them out with a pencil brush, instead of worrying about powder eyeshadow fallout. If you’d like to see me create a smoky eye, let me know! And there you have it! There’s the finished look. This natural eye makeup is seriously perfect and a go-to for me. This looks gorgeous and natural on its own, or you can slap on a pair of false lashes and rock a bold lip. The options are endless. Let me know if you try this and love this trick as much as I do! One more natural eye makeup tip! This natural eye makeup one-product technique can be done with any matte eyeshadow that’s a few shades darker than your natural skin tone. I love using peachy eyeshadows, taupe eyeshadows, and even pink eyeshadows to do this. Experiment and have fun! Love this post? Pin it and save it for later! If you love this natural eye makeup post, check out other ones I’ve written featuring eye makeup! Or browse all of my beauty blog posts HERE! You’re so talented. This is very easy to follow. Perfect post! I love how simple and easy to follow this tutorial was! Forever love your makeup posts! Beautiful natural look. Are you wearing a primer though?